Constantine, the new show centered around the DC character John Constantine, debuted on Friday, and while it may not live up to its source material, it's a fun new addition to the supernatural TV slate thanks to some gruesome visuals and a pitch-perfect leading man. 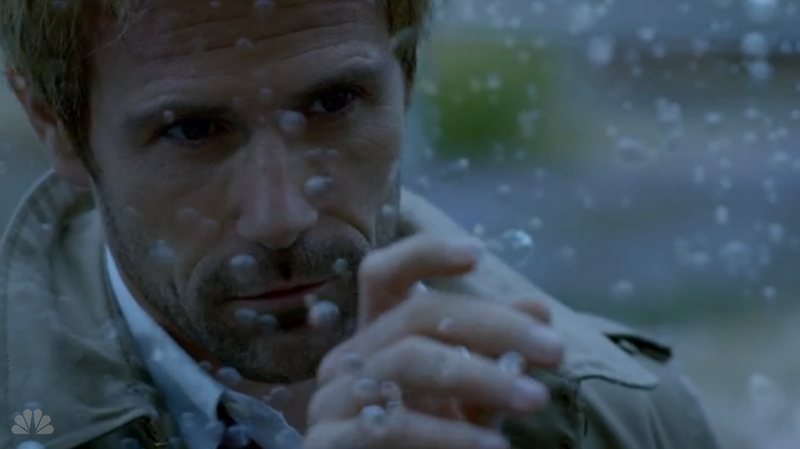 When we first encounter John Constantine (Matt Ryan), he's in a psychiatric hospital, hoping that science and logic will somehow convince him that there are no such things as demons. He's reeling with guilt after allowing a nine-year-old girl named Astra to be dragged to Hell, and he has signed himself up for therapy and electroshock in hopes of forgetting his guilt. From the start, this Constantine is wonderfully dry and self-deprecating. It's clear that he doesn't truly believe that he can convince himself that the world isn't dark and terrible and full of demons, but he's desperate enough to try anything. He deals with his guilt through humor, and he's quick to point its sharp edge at himself. But when he notices that the cockroaches in the hospital are all headed in the same direction, he can't help himself; he has to follow them toward the supernatural phenomenon they're attracted to, a phenomenon he meets with an eye roll and a bit of reluctant but competent exorcism. We quickly learn that the lady who found herself painting the words "LIV DIE" on a cockroach-infested wall was possessed by the spirit of John's dead friend. "LIV" is Liv Aberdeen (Lucy Griffiths), the dead friend's daughter, and John checks himself out of the hospital to protect her. Here's where we get to the weakest part of the pilot, but one that has so little to do with the rest of the series that I'm not overly concerned. Liv appears only in the pilot; John's getting a new Girl Friday (Zed Martin, played by Angélica Celaya) next week. The writers didn't invest much personality in Liv, which is a bit annoying given that she is, momentarily, our point-of-view character. But at least some demented stuff happens to her in the meantime. In addition to the great window-shattering scene in the hospital, we get Liv's murdered neighbor jerking around in her body bag, and then the same body empty-eyed and flailing on the hood of the medical examiner's van. It's moments like these that make Constantine promising, that give us a sense of its slightly sick tone. And there's something aptly invasive about the angel Manny (Harold Perrineau) possessing various people's bodies in order to speak with John. However, Constantine does have, on the whole, a cleaner setting, more like its supernatural TV neighbors than like the Hellblazer comics. Even when Ritchie Simpson (Jeremy Davies) rattles off all the pills he's taking to cope with his own guilt over Astra's damnation, it seems strangely too nice and simple, probably because we're just not seeing the ill effects of his drug use yet. But ultimately, it makes sense that the TV show would have its own tone, one separate from the comics—especially the mind-bendingly mystical Alan Moore comics. But it has some link to the DC universe, complete with a pointed moment involving Dr. Fate's helmet. It's a promising premiere, but we'll have to see how the show changes once we've traded Liv for Zed—and how John's mission to recover Astra's soul plays out over multiple episodes. For now, though, we're just happy to have an actor who embodies the character so well and a show with a dark sense of humor.